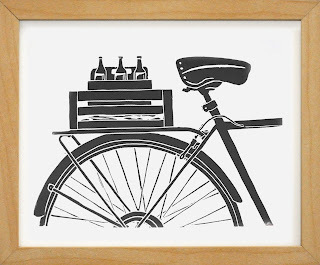 A quick reminder: it’s all about bikes and beer tomorrow in Oshkosh. The Wisconsin Bicycle & Beer Festival starts tomorrow at 11:00 a.m. at Grand Opera House Square in Oshkosh. The centerpiece of the fest will be a 15-mile Alleycat bike ride with five beer stops along the route where they’ll be pouring Wisconsin craft beer for riders. Aside from the ride, there’s going to be Oktoberfest themed games, authentic German food, raffles and music. Registration for the bike/beer ride costs $15. For more info and preregistration go HERE. To visit the Facebook event page go HERE. Whatever you do, be there! Fall must be here because Barley’s Beer Sampling Series is back. This marks the fourth consecutive year that Nate Stiefvater Barley & Hops in Oshkosh has been throwing these nicely priced, mid-week beer fests. He has four of them scheduled for this year’s series and it all kicks off at 7 p.m. next Wednesday, October 2 with host Capital Brewery of Middleton, Wisconsin taking center stage. The full line of Capital’s brews will be there for the tasting, including a bunch of their stuff we don’t normally see around Oshkosh. In addition to the Capital beers, the ales of Magic Hat Brewing of South Burlington, Vermont will also be featured. And if that’s not enough, there’ll be more than 40 other beers as well as spirits and wines to imbibe. Tickets are $20 in advance (get them at Barley’s) or $25 at the door. It’s a good deal either way as it entitles you to all you care to drink from 7-10 p.m. If you go, stop by and say hello. I’ll be pouring and talking about German beers at one of the tasting tables. It ought to be another fun night at Barley’s. 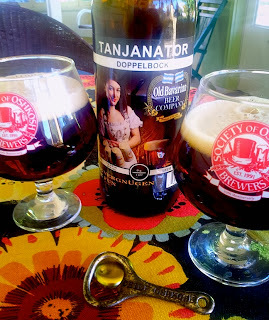 What: Tanjanator Doppelbock by Old Bavarian Beer Company, Appleton WI. Why: Because this is a great time of year to enjoy an authentic Doppelbock. Plus, this beer has its roots in Oshkosh. Tanjanator is brewed and bottled by Fox River Brewing Company of Oshkosh on contract for Old Bavarian in Appleton. 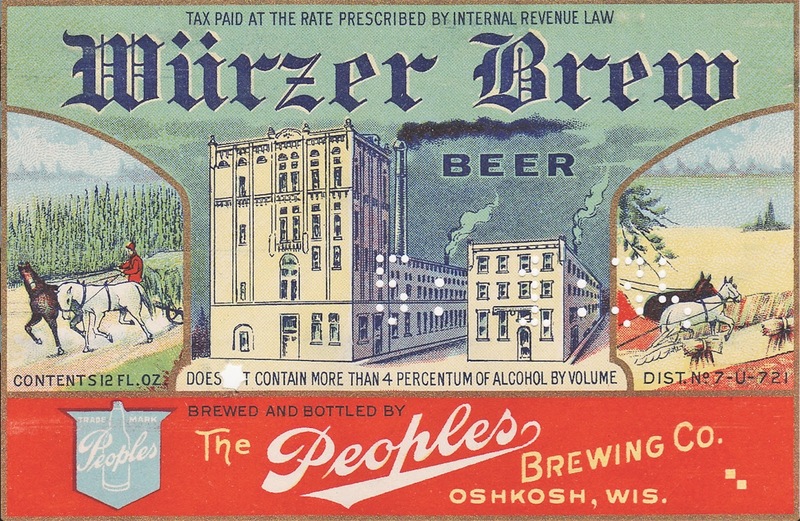 Previously, the Old Bavarian beers had been brewed by the Milwaukee Brewing Co., but last year Fox River took over production. Just last month, Fox River began bottling Tanjanator for Old Bavarian. So now for the first time in 18 years (since Chief Oshkosh Red Lager slipped off the shelves), you can walk down the beer isle and pick up a beer with “Oshkosh” printed on the label. Hey, it made me feel good. And that’s not the only Oshkosh connection here. Steve Olson, the brewmaster who develops the recipes for Old Bavarian, is a former member of the Society of Oshkosh Brewers. OK, that’s all fine, but what about the beer? It goes like this: Tanjanator pours to a deep, dark red with a full, creamy head. The aroma is intense and malty, leaning heavily towards the munich malt side of things with a lot of biscuit and toast coming through. From that I was expecting a big hit of rich malt flavor, but the beer is a bit lean on the toasty melanoidans I was anticipating. It’s a substantial beer to be sure, but just not quite as full-bodied as what the aroma leads you to believe it will be. Still, there's plenty there to enjoy. The beer finishes with a welcome and firm bitterness that keeps you coming back to the glass. Tanjanator is an exceptionally drinkable Dopplebock, despite the fact that its ABV has to be in the 8% range. It’ll warm you, that’s for sure. If you appreciate a good Doppelbock, this is definitely a beer worth checking out. 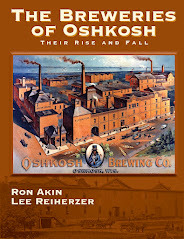 A glass of Oshkosh beer will refreshen you after the night's sleep, invigorate you and fit you for the day's work. A glass of Oshkosh beer with the dinner or lunch, "tops It off" just right and helps the stomach to digest the solid foods. A bottle of Oshkosh beer will be appreciated, especially if body or brain is fatigued. It is nourishing and strengthening and soothes the nerves. In 1913, the American Prohibition movement was on the rise. The Anti-Saloon League, the leading Prohibitionist group of the era, had changed their tact. Instead of fighting for dry laws on a state-by-state basis, they were now agitating and gaining support for a Constitutional Amendment to ban the production and sale of alcohol nationally. They achieved their goal six years later with little obstruction from the nation’s brewers whose limpid response is mirrored in ads such as this one. Instead of defending their human right to make beer, brewers began pretending that what they were really producing was some kind of misunderstood health drink. Hence the advice to take an invigorating guzzle of it as soon as you crawl out of bed in the morning. Well I can think of worse ways to start the day. The consequences may not be as advertised, but it’s bound to be more fun than orange juice. Summer ends this year in Oshkosh with a couple good sign of fine things to come this fall. This Saturday, September 21, Dublin’s Irish Pub in Oshkosh will host their second Craft Beer Festival at the pub at 2070 W. 9th Ave. This is a full-on beer fest with more than 100 beers to sample. And the price is fantastic at just $25 a ticket. It’s for a good cause, too. 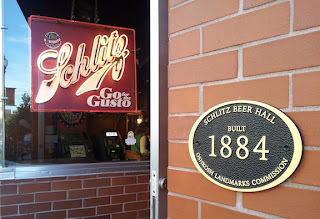 The gang at Dublin’s managed to get most of the beer donated for this event, which will enable them to hand over all the proceeds to the Boys and Girls Club of Oshkosh. Meaning you can get your beer on while doing a good thing for some kids. Tickets are available at the Dublin’s. Another beery bash to take in this weekend is the Oktoberfest celebration at Peabody’s. This one starts Friday at 5:00 p.m. and will run through the weekend. They’ll be ringing in the fall with a slew of Fest beers served in commemorative beer steins, a Pig roast and corn on the cob. They’ll also have live music and drink specials all weekend. The fall drinking season is upon us, Friends. Prost! It’s Firkin time! With the crack of the mallet, Gardina's Wine Bar and Cafe transforms again into Gardina's Beer Bar. Tonight (Tuesday, September 17) at 6 p.m. they’ll be hammering the tap into a cask of O’so Sweet Lady Stout. This is a one-off cask of milk stout brewed with English malts and lactose that was matured on vanilla beans and cocoa nibs. It’s 6.7% ABV and the the only cask of its kind that O’so produced; meaning this will be your one shot at getting a taste of it. It all kicks off at 6 p.m. and the beer will flow until the cask runs dry. At last months firkin bash, the beer was finished in under two hours, so arriving on time would probably be a good idea. Here's a jittery, little video taken at last month's Gardina's Firkin tapping on August 20, 2013. That's Shawn O'Marro doing the honors. Next time you stroll down N. Main, check out the new plaque that was placed this past Saturday on the wall outside of Oblio’s Lounge. 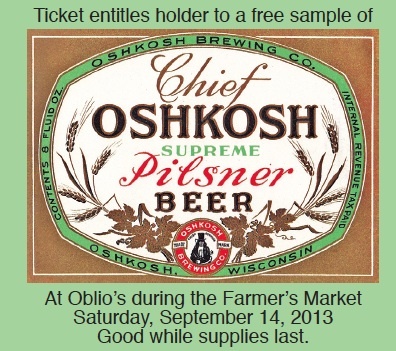 Want a free taste of homebrewed Chief Oshkosh Beer? Here’s what you do: come downtown to the Farmer’s Market this Saturday morning and stop by the Society of Oshkosh Brewers stand; you’ll find them in the 400 block of N. Main. The SOBs will be there talking about homebrew and their upcoming all-homebrew beer festival, Casks & Caskets. If you ask nicely, they’ll be happy to hand you a ticket for a free sample of a homebrew clone of Chief Oshkosh Beer (based upon the 1950s version of the beer). With ticket in hand, take a couple steps over to Oblio’s where an SOB will be pouring out samples of the homebrewed Chief. Hand the SOB your ticket and they’ll hand you a generous sample (while supplies last, of course) of homebrewed Chief Oshkosh. It’s that easy. I tried the beer just this morning (oh, the rigors of blogging) and I’m happy to report that it’s tasting fine. And it just occurred to me that this will mark the fourth time within the past year that a clone of Chief Oshkosh Beer has been pouring in Oshkosh. Goes to show, you can’t keep a good beer down! weekends. Not bad for a home grower, but it’s a pittance in comparison to the yields of the hop farmers of Winnebago County in the 1850s and 1860s. In 1855, for example, Silas Allen collected over 6,000 pounds of hops on five acres of land just north of Oshkosh. Allen’s farm was at the center of a hop growing belt of more than 20 hop yards that spanned the Town of Vinland and reached into the Towns of Winneconne and Clayton. And Allen was a prototype of the hop farmers who, by 1867, had made Wisconsin America’s largest producer of hops. Silas Allen was born in 1813. He had been a hop grower in New York prior to coming to Winnebago County in 1846 and was said to have brought a barrel of hop roots on the wagon that carried he and his family west. He settled in Bald Prairie, a portion of which is now Allenville, in the Town of Vinland and began clearing land for farming. 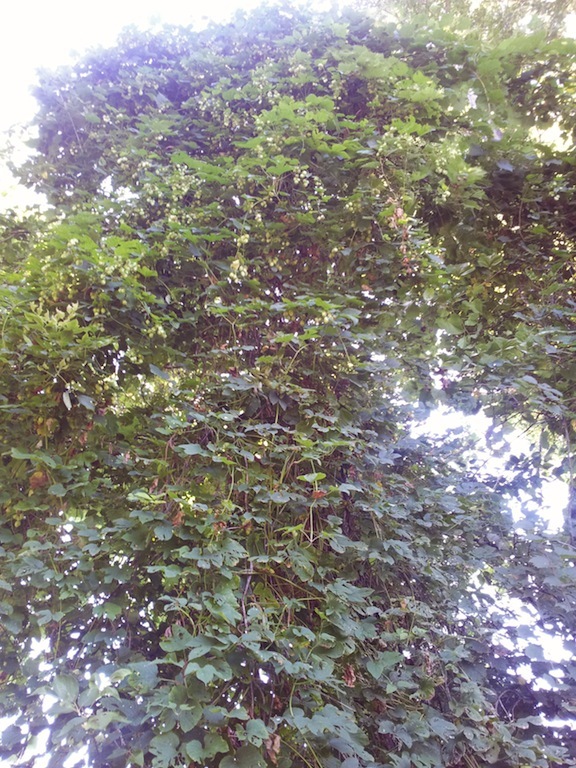 By 1853, Allen’s hop yard was in full flower. Allen had gotten in at the right time. 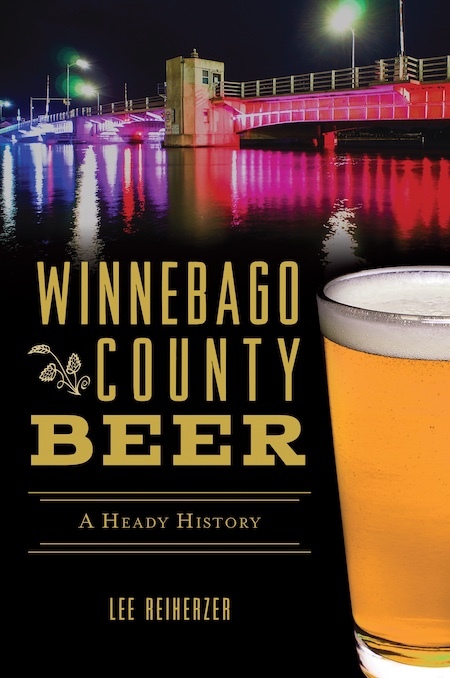 Wisconsin’s brewing industry was booming and the price of hops was on the rise. Allen parlayed his crop into a small fortune that enabled him to purchase surrounding tracts of land. According to his great-grandson, John Allen, the elder Allen and his son Timothy were predatory when it came to their business dealings. “They were aggressive,” John Allen says. “They always had to be the biggest. They were manipulators; legal thieves.” But Silas Allen didn’t have long to enjoy the spoils of his success. He died in July 1859 of sunstroke while harvesting hay. At the time of his death, Allen owned more than 700 acres of land in the Towns of Vinland and Clayton. Timothy Allen took over his father’s hop yards and through the 1860s saw his family’s fortunes continue to increase. But as the decade came to a close an influx of new hop growers and the revival of hop growing in New York led to a glut of hops and a steep drop in prices. Following the crash of the hop market in 1868, the number of hop yards in the Town of Vinland began to decline. The last hop yard on the Allen farm ceased production in 1880, when the Chicago & North Western Railway tracks cut a swath 100 feet wide through it. The disruption brought an end to the Allen’s hop growing. Hops, though, are an incredibly robust plant and they continue to flower on some of the sites of these former hop yards. This summer, I’ve spent time exploring areas in the Towns of Vinland and Clayton where hops were cultivated in the 1850s and 1860s. I’ve found a wealth of hops growing wild in both townships. These may very well be feral hops; as in hops that have survived on their own after their planned cultivation has ceased. On the site of what was the Allen farm they are especially plentiful. 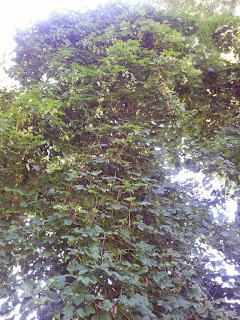 They grow up into trees and onto vines to heights of over 40 feet with a proliferation of cones. The hops are medium-sized and pungent with a sweet lemon aroma that’s somewhat similar to Strisselspalt, but more intense. But will they make good beer? I’m trying to find out. 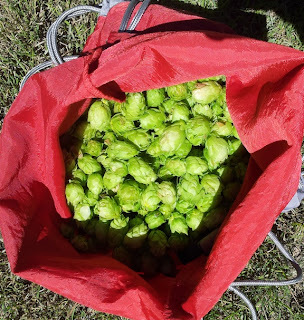 I recently picked just over a half-pound of hops at the site of the Silas Allen farm and then dried them for brewing. This past weekend, I brewed a single-hop beer using these hops. If all goes well, I’ll be serving that beer at this year’s Casks and Caskets. If the hops from the Silas Allen site prove to be of good quality for brewing, my plan is to propagate them and share cuttings with other home growers in the area. We’ll see what happens. Maybe after all these years the Allenville hops are ready for a revival. Here’s an update on the Allenville hops. There's a trio of good looking beer events happening this month in Oshkosh, here’s a quick glimpse of what’s in store. The second installment of Gardina’s Beer Bar Series takes place Tuesday, September 17. This time they’ll be tapping a Firkin of O’so Sweet Lady Stout, a milk stout cask conditioned on vanilla beans and cocoa nibs. O’so produced just a single firkin of this version of the beer, so here’s your one and only chance to try it. The faucet get hammered into the firkin at 6 p.m., and seeing that is half the fun, so get there early as you can. 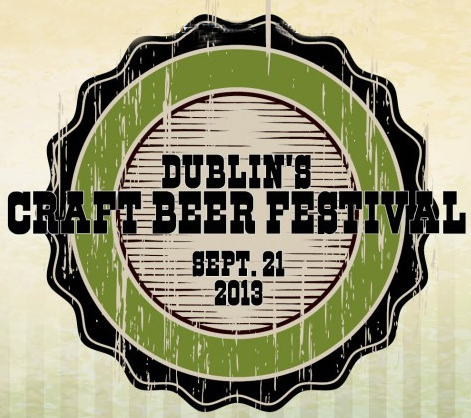 Dublin’s Craft Beer Festival happens Saturday, September 21. This is good. Dublin’s is throwing a full-on beer festival with more than 100 beers to sample. And most of that beer is being donated, meaning 100% of the proceeds will go to the charity they’ve chosen, the Oshkosh Boys and Girls Club. It gets better. During the last 20 minutes of the event you can purchase 6 pack holders from the Boys and Girls Club for $5 and make your own pick-6 pack. The festival will run from 3 p.m. to 6 p.m. and admission is a very reasonable $25. Tickets are being sold at Dublin’s, just ask the bartender. For more info, click THIS. COGtoberFEST Wisconsin Bicycle & Beer Festival wheels around Oshkosh on September 28. This one takes the honors for most unique. 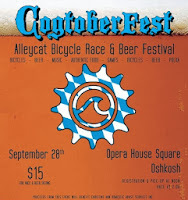 The main event will be an alleycat bike race featuring Wisconsin craft beer along the route. Don’t get hung up on the “race” aspect, it’s really more about peddling around and having some fun. Cyclists of all skill levels are welcome to join in. The route will be about 15 miles around town with 5 beer stops along the way. In addition to the bike ride, there’s going to be Oktoberfest themed games; authentic German food provided by HotDog Charlie’s and Red Robin; raffles and music. The kickoff is at 11:00 a.m. at Grand Opera House Square. The alleycat bike/beer ride costs $15. For more info and preregistration go HERE. To visit the Facebook event page go HERE. I’ll send out a separate note about each of these events as they draw nearer. Have a great weekend! The September issue of the Oshkosh SCENE is now out (get your copy at one of these fine shops) and inside you’ll find my new Oshkosh Beer Garden column. This time, it’s about recent developments at Fox River Brewing / Fratellos here in Oshkosh and Appleton. In the article I cover some of the experiments that Fox River brewmaster Kevin Bowen has been conducting and then sharing over the bar. If you’d like to get a taste of what Bowen is up to, there’s a beer that just went on tap in the Fieldhouse at Fratellos that serves as a good example. The beer is Vintage 2011 Abbey Normal. It’s a Belgian Dubbel that’s been aged for two years and has developed considerably during that time. When the beer came out in 2011, it was giving off a lot of Belgian yeast character. The aroma was heavy on clove and banana esters while the flavor was dominated by molasses and dark fruit underpinned by the phenolic bite common to Belgian yeast strains. Age has changed the ale’s scent substantially with those bold esters almost entirely subdued. The flavor has taken on a brandy-like aspect with a nice bit of mellow caramel coming up as well. The beer is also now finer and less full bodied. Despite being 6.75%, it’s very drinkable. The only thing is, you have to let it warm a bit before you start going at it. They’re serving this one too cold and you’ll miss much of its complexity if you don’t allow it to warm. It’s a beer worth giving some time to. Here's an ad from the Oshkosh Daily Northwestern of August 31, 1935. It appeared a time when Oshkosh was hurting. In the late summer of 1935, Oshkosh was firmly in the grip of the Great Depression. The city had lost 40% of its manufacturing jobs and overall unemployment was estimated to be at nearly 50%. But over at the Oshkosh Brewing Company, they were doing their part to boost the local economy – not to mention the local cheer – by pumping out beer. In 1935, OBC had 40 employees on the payroll and together they managed to produce over 40,000 barrels of beer. That’s a lot of lager for a city of less than 40,000 that also had two other breweries in operation. Obviously, there were plenty of folks in Oshkosh in 1935 who weren’t going to allow the Depression dampen their spirits.